You've made a spellbinding drama or a heart-wrenching documentary. Now what? Now you try to sell it to distributors, at the Sundance Film Festival. As Sundance begins here on Thursday, new players like Amazon are competing with longtime buyers like the Weinstein Company. The ensuing deals are expected to demonstrate Hollywood's digital transformation -- as an increasing number of flicks are released through Internet rental stores like Apple's (AAPL) iTunes and streaming services like Netflix. 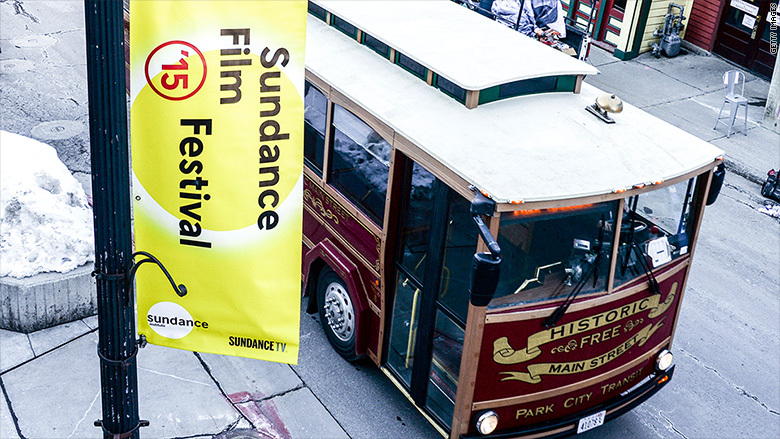 Making it to Sundance -- the country's preeminent film festival, co-founded by Robert Redford in 1978 -- is a goal of filmmakers all around the world. This year 4,105 feature-length films were submitted; of those, 123 were selected to actually screen here. Some of them will be competing for awards; others will be competing for those aforementioned deals; and many will be seeking both. Media executive Jason Hirschhorn, who's been coming to the festival to see films for 11 straight years, said observers expect acquisition prices will be "bigger than ever as new players like Amazon Movies and many smaller digital platforms enter the space." Earlier this week, Amazon (AMZN) announced plans to acquire and produce movies for its streaming video service, and it'll be scouting for potential purchases at the festival. Redford, at an opening press conference on Thursday, said he thought Amazon is "probably taking advantage of change" in the media industry. He said he knew little of the company's plans but welcomed "another player in the mix." Amazon certainly isn't alone -- executives from sites like Hulu, Vimeo and YouTube will be present, too. That means some of the movies premiering here, like the opening night documentary "What Happened, Miss Simone?" about the musician Nina Simone, will be accessible to viewers at home in a matter of months. Netflix (NFLX) snapped up streaming rights to that film last month. Sitting alongside the Internet streaming execs will be their counterparts from television networks, including HBO, Showtime and CNN, the owner of this web site. On Thursday Showtime acquired the TV rights to "Dreamcatcher," a documentary about a foundation that fights human trafficking, a few hours before the film's premiere. Two documentaries co-executive produced by CNN Films are being screened at the festival this weekend. They will appear on television at a later date. Plenty of filmmakers still yearn for distribution deals that start with theatrical screenings. There's nothing quite like buying a ticket and sitting down in a darkened theater -- like so many people will be doing at the festival for the next two weeks. And some high-profile features premiering at Sundance will surely perform well at the box office later this year and be nominated for Oscars this time next year. Case in point: Sony purchased "Whiplash" here last year, and now the movie is a contender for best picture. This year, "supply is limited, and demand is at an all-time high," The Hollywood Reporter said, noting that one highly-anticipated comedy, "Mistress America," was bought by Fox Searchlight for theatrical release two weeks before it even arrived in Utah. But many in the independent film world -- particularly in the documentary portion -- have been tilting toward Internet streaming and television distribution for several years. Sony's simultaneous release of "The Interview" in theaters and on the Internet was unusual because it was a broad, crowd-pleasing comedy, meant to make tens of millions of dollars. But Internet releases are already the norm for the kinds of films that generally gain attention at Sundance. Hirschhorn, now the CEO of REDEF, said "almost all the movies -- with the exception of several documentaries that are with Netflix or HBO or CNN -- came into the festival looking for a deal. It really is a market." "There's a question whether this market creates sustainable revenue, in terms of upfront deals and performance, but certainly movies will find homes," he added. In fact, would-be buyers started screening some of the movies at the festival weeks ago. When it comes to documentaries in particular, Sundance is traditionally "a place where brand new distribution players try to make noise by outspending on an acquisition title," film curator Thom Powers said. "That makes for a nice headline in January," he said. "But there's an increasing feeling among filmmakers that they need to look past the advance and scrutinize how their film will be handled later." That's why, for Powers, the most important part of Sundance is Monday's day-long workshop for filmmakers, where they can explore "new tools and techniques to take more control of their own distribution." Sundance officials promoted that workshop at Thursday's press conference and said digital distribution can supplement some movies' traditional releases while being a full-blown alternative to theaters for other movies. "When there are new companies wanting to make and support independent film, that can be nothing but a good thing," Sundance Institute executive director Keri Putnam said.